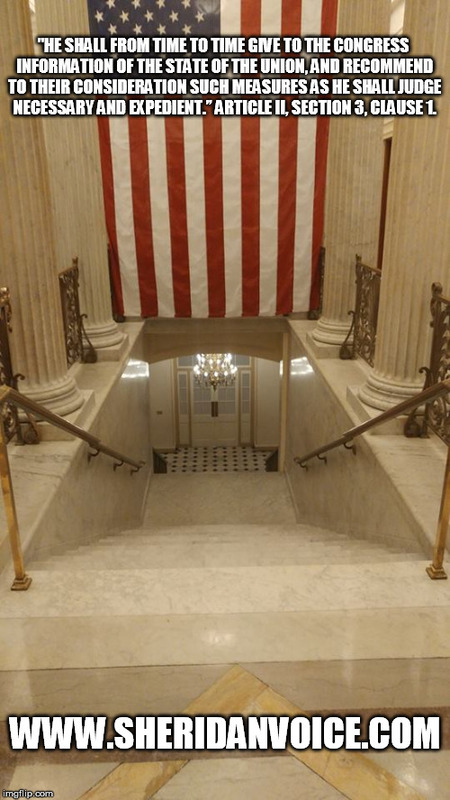 The stairway the President walks down to meet with Congress. The Constitution says the President “shall from time to time give to the Congress Information of the State of the Union, and recommend to their Consideration such measures as he shall judge necessary and expedient.” Article II, Section 3, Clause 1. This Constitutional provision gives the President the right, at various times, to report problems or make recommendations directly to the people’s representatives. The first State of the Union was delivered to Congress on January 8, 1790 (See a portion of his message below). 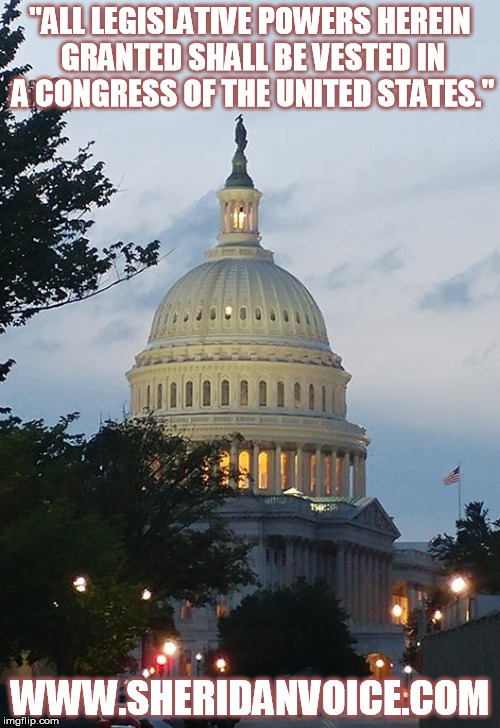 The purpose of the message or event is to give the President an opportunity to “recommend needed legislation to Congress without violating the doctrine of separation of powers” (The Making of America). Arthur J. Stansbury, in 1828, published “A Catechism On The U.S. Constitution.” In the section dealing with the State of the Union, Stansbury instills in the children the principles of this provision while at the same time alerting them to the dangers of Presidential tyranny and the violation of the separation of powers – yes, children were taught this! Q230. What are the duties of the President? A. He must from time to time give information to Congress of the state of the United States. Q231. Does he know what is the state of the Nation better than the Members of Congress? A. Yes. His office is such that he has a better opportunity of knowing it. Each Member of Congress resides only in one State, but the President resides at a spot in the middle of them all. It is the duty of all officers below him, to send reports of the various affairs in which they are employed, to one or other of the Heads of Departments, and these lay all the knowledge they thus obtain, before the President for his direction and assistance in the many and great duties he has to perform. He is, therefore, of all persons, best acquainted with the general concerns of this nation. Q234. Does he do more than communicate information to the Congress? A. Yes; his duty is also to recommend to them such things as he thinks will be for the advantage of the country. Q235. Are they obliged to do as he advises? A. No. They pay respectful attention to what he says to them, and listen to the reasons he gives in favor of the measures he recommends, but they are at full liberty to follow their own judgments in all cases. Q236. Is it to be desired that Congress should always comply with the advice of the President? A. No; for then his advice would, in time, come to have the authority of a command; it would be the President and not Congress who made the laws; and the liberty of the country would be in the greatest danger. There is no more dangerous despot than one who can make his will obeyed, and yet preserve the forms of a free government. August Caesar ruled the whole Roman Empire with absolute sway, yet did every thing by resolves of the Senate, as if Rome was free. Presidents Washington and Adams delivered their messages to Congress orally. Jefferson, however, submitted his in writing. Presidents after Jefferson followed his written example until Woodrow Wilson revived the in-person method. From 1790 to 1946, the State of the Union was called the “Annual Message, after 1947 it was called the State of the Union Address. The State of the Union has kept pace with changing technology. President Calvin Coolidge, in 1923, gave the first State of the Union over Radio. In 1947, President Truman’s was the first to be televised. President George W. Bush, in 2002, gave the first live Webcast State of the Union, and in 2004 his became the first to be broadcasted in high definition. The longest: President James Earl (Jimmy) Carter 33,667 words in 1981 (written). President William J. (Bill) Clinton 9,190 words in 1995 (spoken). The shortest: President George Washington, 1790, 1,089 words. Average length: 19th century was about 10,000 words; late 20th century, about 5,000 words. Most Messages/Addresses given: President Franklin Roosevelt, 12 (10 were personal appearances before Congress). Fewest Messages/Addresses given: President Zachary Taylor, 1; President William Henry Harrison, 0; President James A. Garfield, 0. “To the security of a free constitution it contributes in various ways – by convincing those who are intrusted with the public administration that every valuable end of government is best answered by the enlightened confidence of the people, and by teaching the people themselves to know and to value their own rights; to discern and provide against invasions of them; to distinguish between oppression and the necessary exercise of lawful authority; between burthens proceeding from a disregard to their convenience and those resulting from the inevitable exigencies of society; to discriminate the spirit of liberty from that of licentiousness – cherishing the first, avoiding the last – and uniting a speedy but temperate vigilance against encroachments, with an inviolable respect to the laws…. Gentlemen of the Senate and House of Representatives…I have directed the proper officers to lay before you, respectively, such papers and estimates as regard the affairs particularly recommended to your consideration, and necessary to convey to you that information of the state of the Union which it is my duty to afford. The welfare of our country is the great object to which our cares and efforts ought to be directed, and I shall derive great satisfaction from a cooperation with you in the pleasing though arduous task of insuring to our fellow citizens the blessings which they have a right to expect from a free, efficient, and equal government.” George Washington, January 8, 1790. “President Washington began this tradition in 1790 after reminding the Nation that the destiny of self-government and the ‘preservation of the sacred fire of liberty’ is ‘finally staked on the experiment entrusted to the hands of the American people.’ For our friends in the press, who place a high premium on accuracy, let me say: I did not actually hear George Washington say that.” – Ronald Reagan, January 26, 1982. “…The occasion has been judged proper for asserting, as a principle in which the rights and interests of the United States are involved, that the American continents, by the free and independent condition which they have assumed and maintain, are henceforth not to be considered as subjects for future colonization by any European powers….we should consider any attempt on their part to extend their system to any portion of this hemisphere as dangerous to our peace and safety.” – James Monroe, December 2, 1823. These words defined what would later be known as the Monroe Doctrine. “In the future days, which we seek to make secure, we look forward to a world founded upon four essential human freedoms. The first is freedom of speech and expression—everywhere in the world. The second is freedom of every person to worship God in his own way—everywhere in the world. The third is freedom from want—which, translated into world terms, means economic understandings which will secure to every nation a healthy peacetime life for its inhabitants-everywhere in the world. The fourth is freedom from fear—which, translated into world terms, means a world-wide reduction of armaments to such a point and in such a thorough fashion that no nation will be in a position to commit an act of physical aggression against any neighbor—anywhere in the world.” – Franklin D. Roosevelt, January 6, 1941.